§ 297-382 Buffer yard standards. § 297-385 Illustrations of buffer yard and buffer yard structures. The illustrations in this article graphically indicate the specifications of each buffer yard. Buffer yard requirements are stated in terms of the width of the buffer yard and the number of plant units required per 100 linear feet of buffer yard. 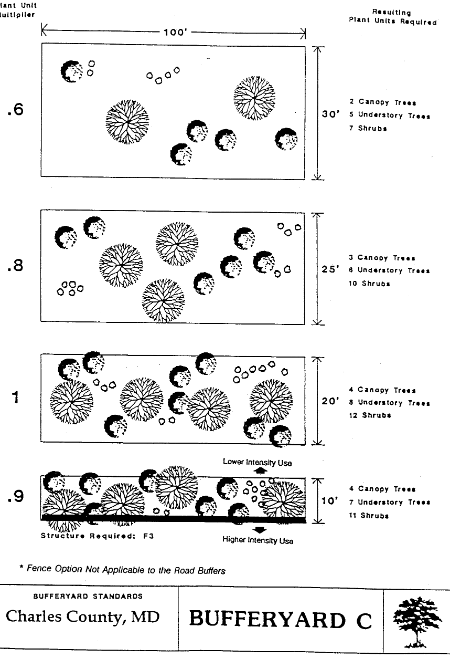 The requirements of a buffer yard may be satisfied by any of the options thereof illustrated. The plant unit multiplier is a factor by which the basic number of plant materials required for a given buffer yard is determined given a change in the width of that yard. The type and quantity of plant materials required by each buffer yard, and each buffer yard option, are specified in this article. Only those plant materials capable of fulfilling the intended function shall satisfy the requirements of this chapter. The options within any buffer yard are designed to be equivalent in terms of their effectiveness in eliminating the impact of adjoining uses. Generally, the plant materials which are identified as acceptable are determined by the type(s) of soil present on the site. 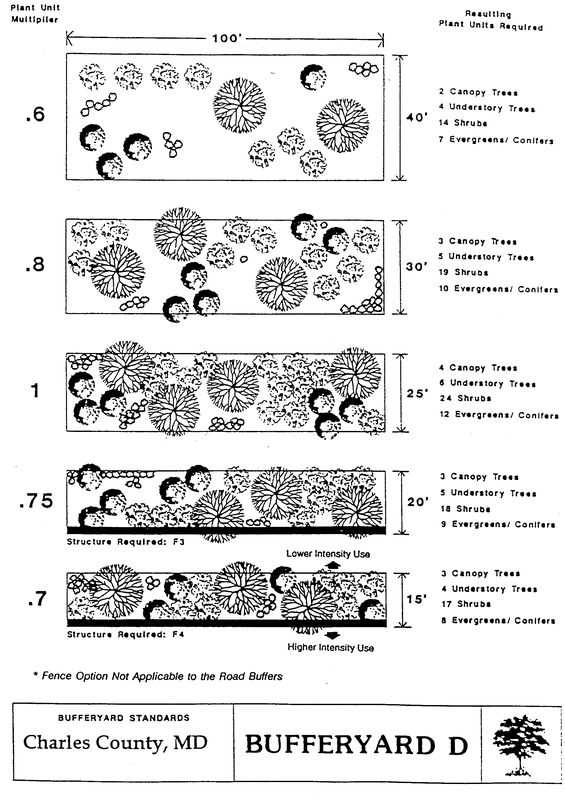 The illustrations have mathematically rounded the number of plant units required for each option within a given buffer yard. 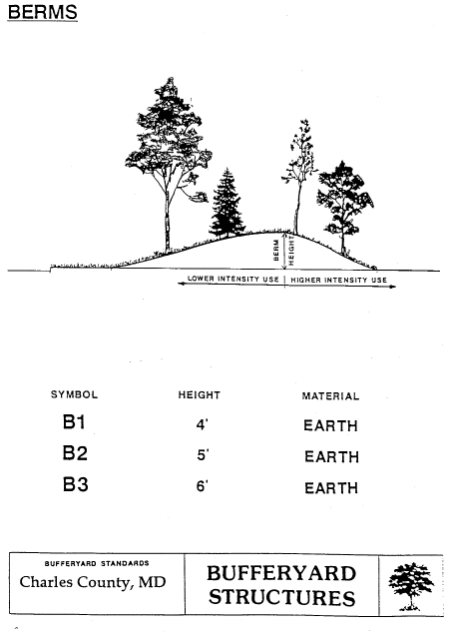 In actual practice, mathematical rounding would be applied to the total amount of plant material required by a buffer yard, not to each one-hundred-foot length of buffer yard. 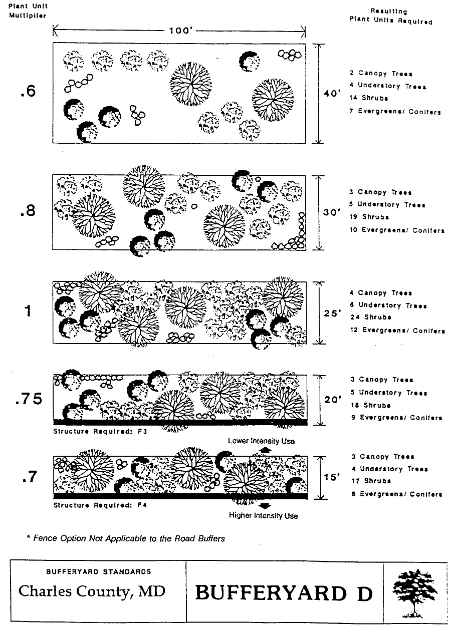 All of the illustrations are drawn to scale and depict the buffer yard according to the average projected diameter of plant materials at five years after planting. Each illustration depicts the total buffer yard located between two uses. 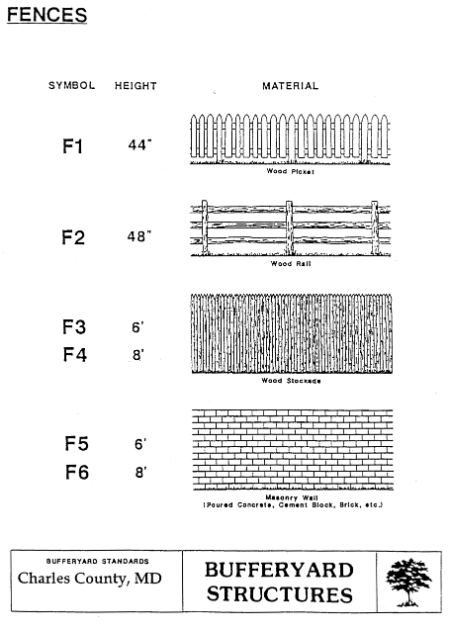 Whenever a wall, fence or berm is required within a buffer yard, these are shown as "structure required" in the following illustrations, wherein their respective specifications are also shown. All required structures shall be the responsibility of the higher-intensity use. Whenever a wall is required in addition to a berm, the wall shall be located between the berm and the higher-intensity use, in order to provide maximum sound absorption. Whenever property is affected by these buffer yard requirements, the property owner or applicant shall prepare a landscape plan for approval by the Zoning Officer. 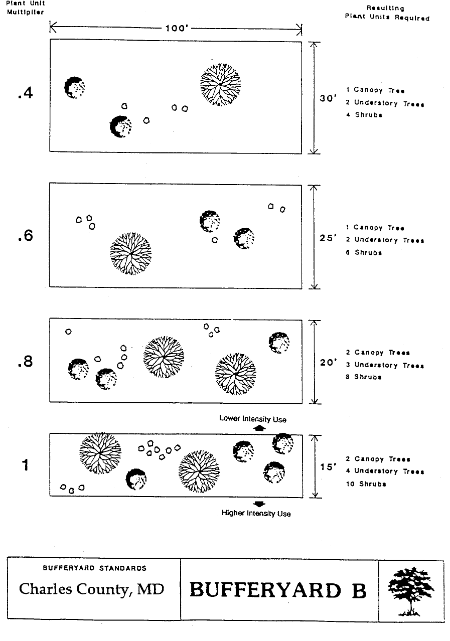 In Buffer Yards C, D and E, evergreen canopy or evergreen understory trees may be substituted for deciduous canopy forest trees without limitation. In the case of deciduous canopy forest trees, up to a maximum of 50% of the total number of the deciduous canopy trees otherwise required. In the case of deciduous understory, without limitation. In all buffer yards, evergreen or conifer shrubs may be substituted for deciduous shrubs without limitation. If the development on the adjoining use is existing, planned or deed-restricted for solar access, understory trees may be substituted for canopy trees where canopy trees would destroy solar access. Existing healthy trees and understory vegetation shall be preserved in the buffer yard areas wherever possible. 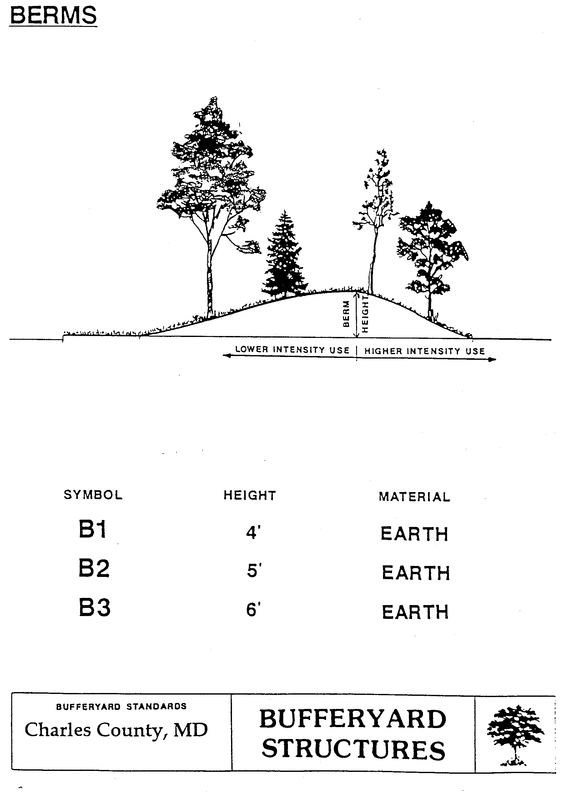 Protection of retained existing vegetation during construction shall be in accordance with Appendix E-1. Additional plantings may be added within the buffer yard to meet buffer yard requirements or for enhancement. 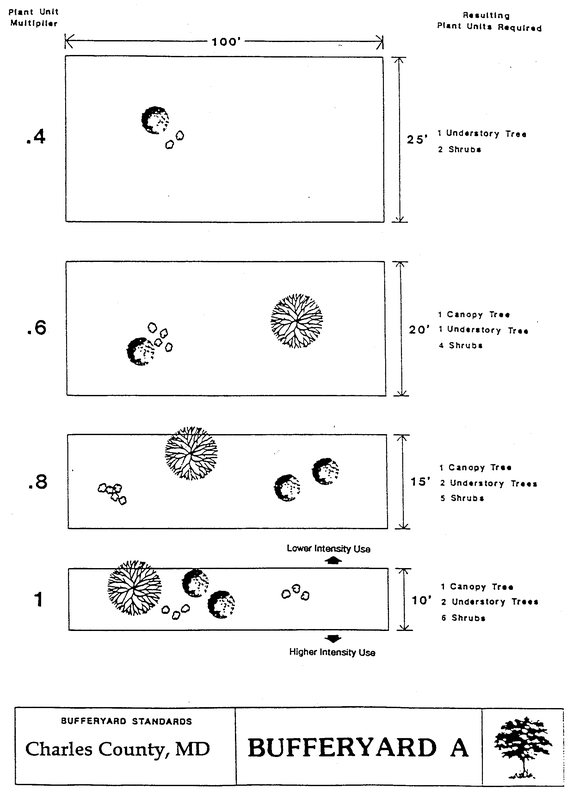 Evergreen (or conifer) Class III and IV plant materials shall be planted in clusters rather than singly in order to maximize their chances of survival. 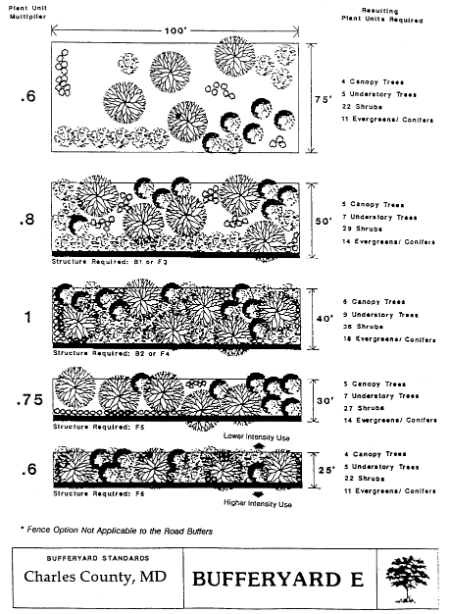 Berms with masonry walls (BW1, BW2 and BW3) required of Buffer Yard D and E options are intended to buffer more significant nuisances from adjacent uses and, additionally, to break up and absorb noise, which is achieved by the varied heights of plant materials between the masonry wall and the noise source. 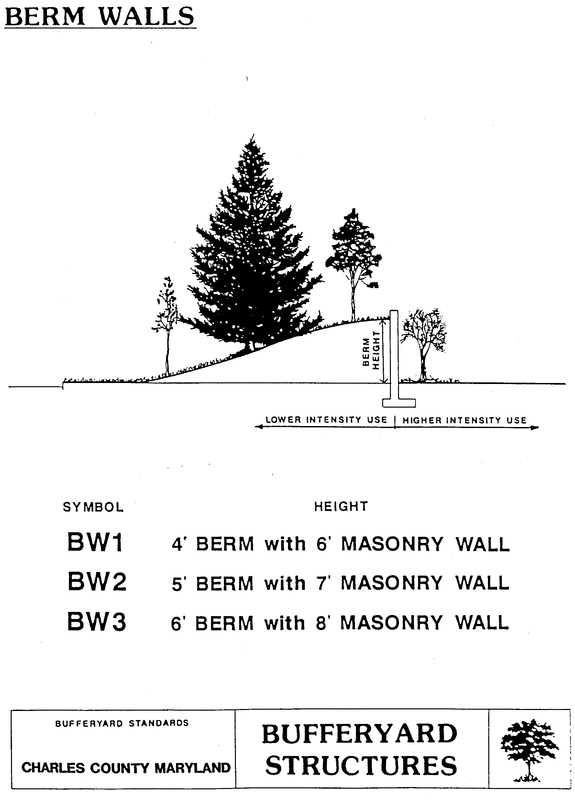 When berms with walls are required, the masonry wall shall be closer than the berm to the higher-intensity use. Within a Buffer Yard, a planting area at least five feet wide containing 15% of the total plant requirements (based on the multiplier = 1) shall be located between the masonry wall and the higher-intensity class use. 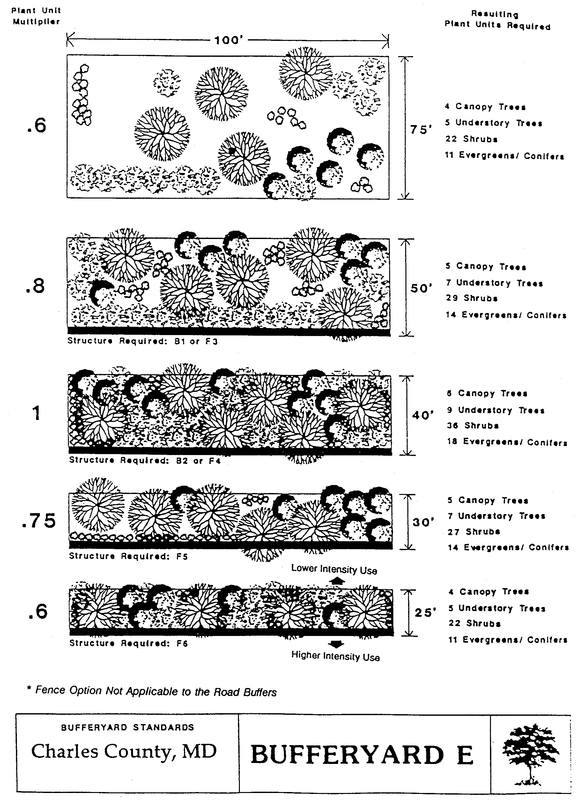 These plants shall be chosen to provide species and sizes to reduce noise in conjunction with the wall. All buffer yard areas shall be planted with native grass unless ground cover is already established. All plant material required to meet buffer yard requirements shall be native Maryland species. A maximum of 1/3 of the trees are to be a single species. 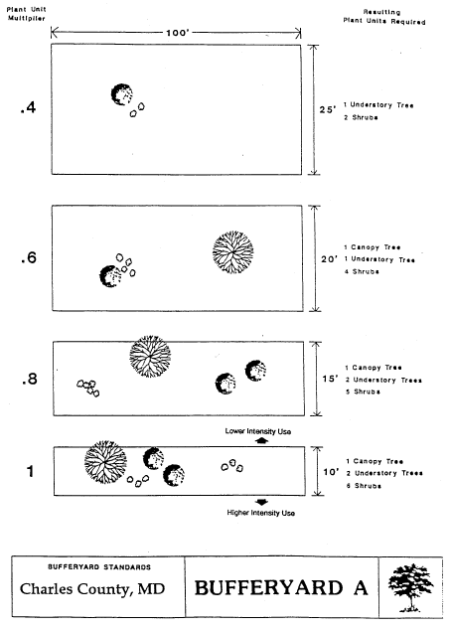 See the following pages for illustrations.